Late Tuesday night at the featured table at the Rio, what will be the final hand of the 2011 World Series of Poker until November was dealt, when John Hewitt’s pocket 33 was bested by Eoghan O’Dea’s KJ, eliminating Hewitt from the tournament and securing O’Dea and eight other players a spot amongst the final nine players in the 2011 WSOP Main Event. 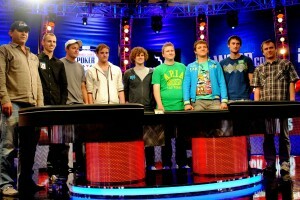 Amazingly, not a single player is extremely short-stacked, and most of the field is bunched up in the 20 million chip range –unlike last year where Jonathan Duhamel and John Dolan entered the final table with 65 million and 46 million chips respectively, while Jason Senti and Soi Nguyen held less than 10 million chips each. The three US players remaining, Matt Gianetti, Phil “USCphildo” Collins, and Ben Lamb are all high-stakes poker pros and are likely to be amongst the odds-on-favorites to win the WSOP Main Event when the betting lines are released. Another player that has an excellent chance of winning the Main Event is Irishman Eoghan O’Dea, who in addition to heading into the November final table second in chips, comes from a strong poker pedigree –his father has a WSOP bracelet and two Main Event final tables on his resume—and throughout his time on the featured tables proved he is a more than capable poker player. All of the players will now have four months off to get their houses in order and prepare to play for the $8.7 million first-place prize in November. It will be interesting to see if the sponsorship deals are still as lucrative for the November Niners after Black Friday removed the two largest sponsorship providers in Full Tilt Poker and PokerStars. This entry was posted on Wednesday, July 20th, 2011 at 10:53 am and is filed under Poker News. You can follow any responses to this entry through the RSS 2.0 feed. You can leave a response, or trackback from your own site.